The crying started with a visit to the university library. It was the middle of our residency week, and we had spent the previous few days discussing the importance of keeping our focus as librarians on community, innovation, collaboration, and creation. I had embraced the concepts of roving and embedded librarians, empowering people through their very availableness. I had considered the question of digital and bookless libraries, and found that they had a place in my universe. Then we went to see the university’s special collections and I was reminded just how important information artifacts can be to inspiration. After days of smartphone notes, paperless paper-writing, and laptops perched on auditorium desks, our special collections experience was decidedly unTech. Sumerian tablets, Egyptian papyrus, illuminated manuscripts, gilded maps and rare first editions of amazing books were presented to us in a serene, temperature and humidity controlled room. There were occasional delighted gasps and quiet exclamations of wonder as the professor ushered past with each item, allowing us a closer look without risking damage to these important artifacts. A flushed cheek or suddenly moist eyes were the best indications of just how powerful the physical presence of these treasures were and it was intriguing to see who was affected most by which bits of history. 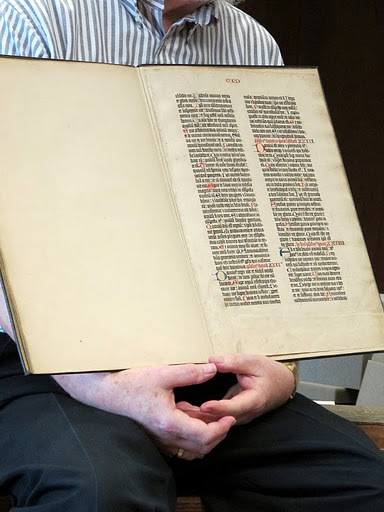 It was the page from a Gutenberg Bible that got me. I had viewed the treasures leading up to it with reverent wonder, but it was that one leaf of printed Psalm, and the idea that such a fragile thing represented such revolutionary change, that choked me up. That simple page represents to me the very basis of what compels me to study librarianship. To me, it represents the possibility for equitable access to information and ideas. It represents freedom. That afternoon’s visit highlighted the balance involved in the way ahead for New Librarians. We are information specialists connecting people with the resources they seek for knowledge creation and we are caretakers of the materials that connect us viscerally with our cultural history. We are also storytellers, ambassadors of information literacy, co-learners across the reference desk, organizers of information, and advocates for equitable access to information in our communities. And, quite often, we are treasurers of information artifacts. Special thanks to fellow student Jaena Cabrera for allowing me to use her photograph for this post. You can visit her blog, Jaena Rae in Library Land here.